Piranha & Man from U.N.C.L.E. 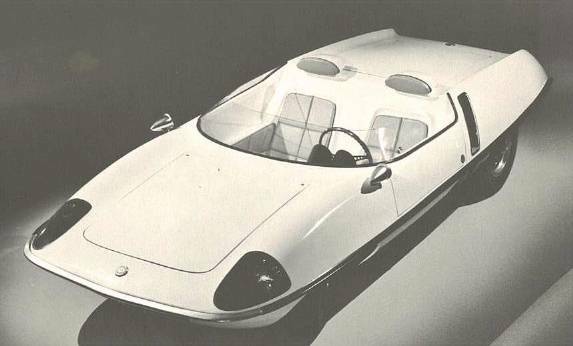 Car - Piranha "Roots"
In the early 60's, Marbon Chemical, a division of Borg-Warner, was trying to promote the use of plastics for the structural parts of the automobile. This material was called "Cycolac ABS." It was determined the best way to do this was to produce an entire car using this material. 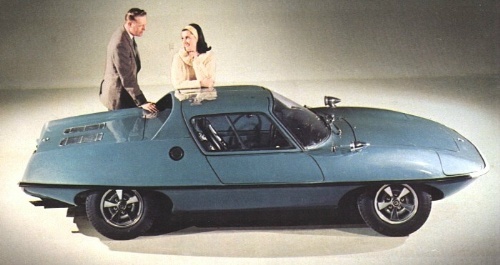 The car was called the "CRV" (Cycolac Research Vehicle). 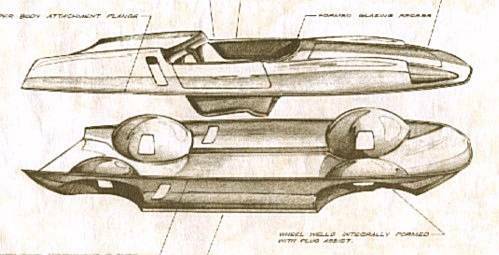 Marbon Chemical designer Dann Deaver was responsible for the futuristic look of the body. "The inception of the CRV was as unique as the car itself. It was originally conceived by Centaur Engineering Corporation as a production feasibility. The aid of Marbon Chemical was then requested for co-development of this all Cycolac car. The scope of such a project however, demanded the aid of other specialists. William M. Schmidt Associates, a leader in transportation design, was given the responsibility of body design and developement." The Jentzen-Miller Co. (specialists in plastic forming)were also co-sponsors. Artist rendering of the CRV. This drawing shows the construction of the two-piece plastic body. Several prototype cars were built and shown around the country to help Marbon assess public and trade reaction to this practice. The first vehicle, called the CRV, consisted of a two-piece thermoformed plastic body mounted on a tubular chassis. The upper half had formed-in-place bucket seats, console, arm rests, and dashboard. The bottom half included fenders, wheel wells, and full underpan. It was light and strong, and was powered by a rear-mounted, 42 hp, water-cooled Sunbeam engine. The first CRV prototype built by Marbon Chemical. Another view of the CRV. This rear end treatment was unique to the first CRV. 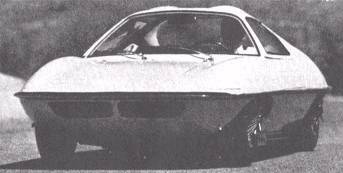 The next prototype was called the CRV-II and was equipped with a Corvair engine and featured a monocoque chassis constructed of Cycolac with metal braces for suspension pieces. It weighed only 1,400 pounds. The upper body received some changes and included a roll bar. The CRV-II included a revised upper body and turbocharged engine. 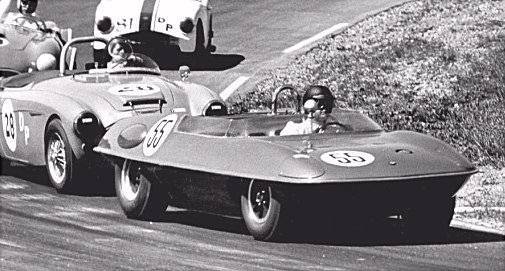 "The CRV-II was raced in the 1965 SCCA National Road Races and won the Central Division Championship in D Modified, was first in class in half of its races, and placed in the rest. The CRV-II never failed to finish a race it entered." Note the bulges in rear body panels to allow for the larger racing tires. and placement of the mirrors on the front fenders. The next coupe version built was the CRV-V. It is easily identified by the rectangular mirrors located on the doors. 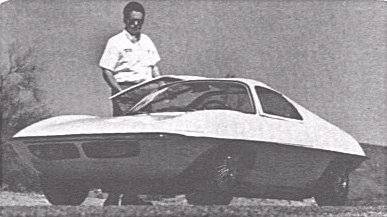 One company that was attracted to the concept was AMT Corporation, a plastic model car company. 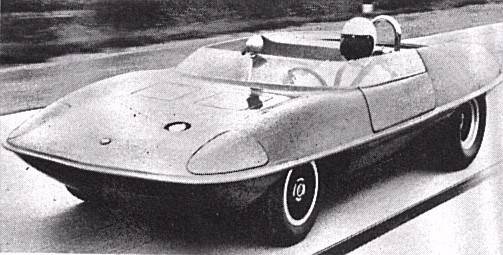 AMT was so impressed that they decided to build and sell real cars and committed to producing a limited production car, now called the Piranha, at a rate of 50 units per year, from their Phoenix, AZ "Speed & Custom Division" run by Gene Winfield. Winfield also built custom and special cars for TV & movies. Below is a photo of the production version of the Piranha. 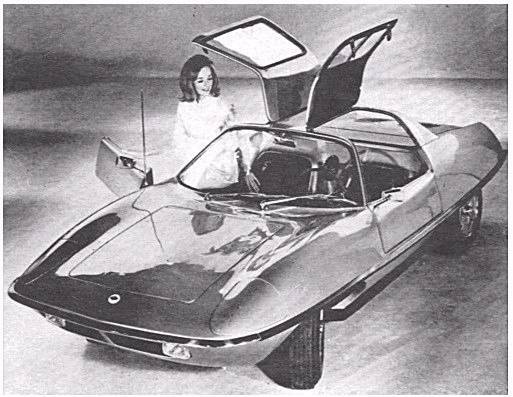 Note the doors open in a conventional manner, but the side windows & a portion of the roof open upward for easier entrance into the interior. Also note the bulges in the top portion of the doors which increases the headroom. small size of the Piranha. 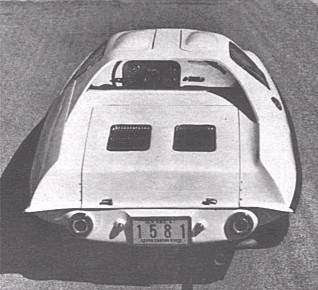 To help promote interest in the car, AMT also offered a kit of a roadster version of the Piranha for SCCA racing. 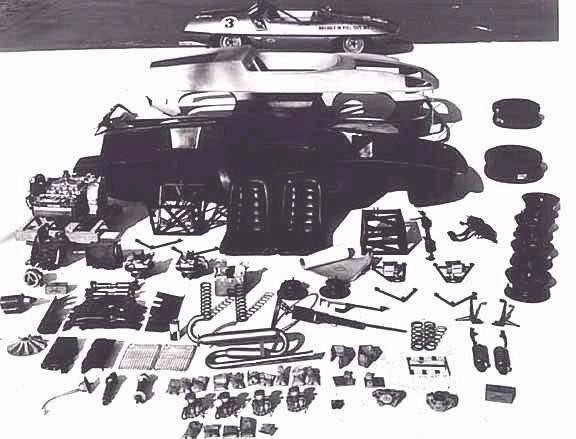 Below is a photo of all the parts included in the kit. Note the completed race car in the background. Unfortunately, interest in the limited production car was not what AMT had hoped for. 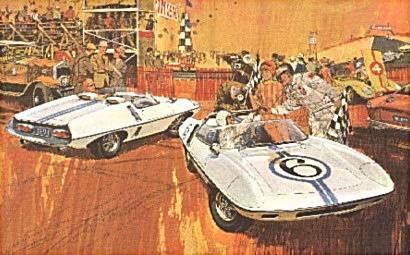 That, coupled with the cancellation of the Corvair by Chevrolet and a recession in the model car hobby, forced AMT to close the project. However, due to Gene Winfield's involvement with the TV studios, this limited production car would ultimately become a star.